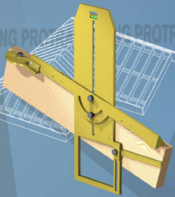 Derek Pater recently contacted us to do a review of his unique roofing protractor system. The tool simplifies many of the calculations that go into building a roof, and is useful for all types of roof designs. Unfortunately, none of us here at OPC are planning to build a roof anytime soon, so we couldn’t help Derek out (except for providing him that link and letting you know about the tool if you’re planning to build a roof). Editors Note: This article was originally published in December of 2008. Since that time we’ve added further roof types, terms and graphics to create a more complete list. Hip Roof: A type of roof containing sloping planes of the same pitch on each of four sides. A hip roof contains no gables. Gable Roof: A type of roof containing sloping planes of the same pitch on each side of the ridge. A gable roof typically contains a gable at each end. Skillion Roof: A Skillion Roof slopes from one side of the building to the other in a single span and no ridge. As a result the external walls are of varying heights. Lean-to Roof: A roof with one slope only that is built against a higher wall. Jerkinhead Roof: Consists of a Gable Roof with a truncated Hip Roof section at the top to reduce the height of the Gable. Dutch Gable: Is a combination of a Hip roof with a small Gable at the top and a sloping roof below. 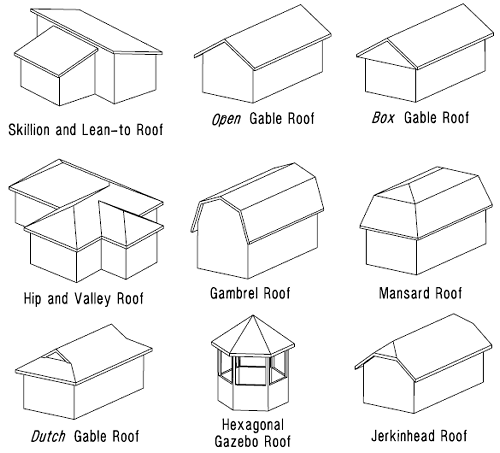 Gambrel roof: A type of roof containing two sloping planes of different pitch on each side of the ridge. The lower plane has a steeper slope than the upper. A gambrel roof usually contains a gable at each end, just like a standard gable roof. Mansard roof: A type of roof containing two sloping planes of different pitch on each of four sides. The lower plane has a much steeper pitch than the upper, often approaching vertical. It contains no Gables. Gazebo Roof: Often Hexagonal or Octagonal but usually symmetrical in their design. Saltbox Roof: A type of roof with asymmetrical roof faces. The asymmetry produces one facade that is two stories high dropping to a single story. A saltbox roof contains a gable at each end. Pyramid Hip Roof: A type of roof where all four sides come to a point at the roof peak. M-Shaped Roof: A type of roof similar to a double-pitched roof except that it rests on two load bearing walls only. It also features a central gutter at a right angle to the front facade. Butterfly Roof: A type of roof formed by two gables that pitch sharply from either side toward the center to resemble a butterfly’s wings. Combination Roof: A combination of two or more roof types. Dormer: A structural element that protrudes from the sloping plane of the roof surface. Flat Roof: A type of roof that has no slope and may terminate with or without eaves. Shed Roof: A type of gabled roof with a single roof face falling away from the main building. If you’re looking for a roofing term not listed here, we’ve found a good resource from FloridaDisaster.org. Click here to see a more extensive guide. 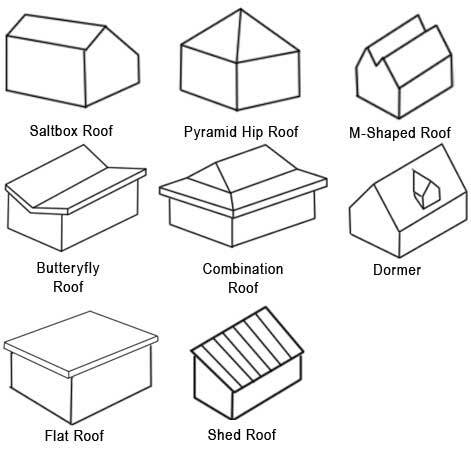 Here’s a visual of each of these types of roofs. It’s worth noting that these roof types can be mixed and matched in a single, large home to create a unique look. For example, it’s not uncommon for a Gazebo roof to augment any one of these styles in a design. What do you think? Did you learn something? We did! Interesting article! I hadn’t heard the term “jerkinhead roof” before. Instead, I’ve heard that roof style called “clipped gable.” It is a common roof variation for bungalows, probably because it makes the house look shorter and more horizontal. What about my absolute favorite, the mathematically challenging hyperbolic paraboloid or saddle roof? I have an ‘L’ shaped footprint shed. I want to install a Hip & Valley roof, but, I want to connect the bottom edge of the roof between the two leg points to create a sort of canopy so that I can barbeque under it on rainy days. How do I go about that? My contractor told me he was going to do a “Texas Hip Gable for the front of the house. What is that? I lived in TX for over 40 years. When building a home there in 1980, we were told they would install a Hip Gable. It was a simple open gable roof construction without much overhang at the ends so there was a more contemporary appearance. Interesting. Around here we don’t generally have overhangs on our gables… and it does look more contemporary. That makes sense. Thanks so much for clarifying! M shaped roof is weird, so is the butterfly. they look like inventions from the 80’s to be interesting and cause massive water damage inside a house. or maybe you can do things like that somewhat safely where you don’t get snow. Also, the jerkinhead roofs are popular in the black forest. I’ve read that in the 18th century UK, they used M-shaped roofs to provide a steep slope without making them crazy tall. By dividing the roof into two parts, it made things look more in proportion. Not sure where they’d use em today. I had the same initial reaction as you- looks like the perfect place for leaves to build up and water to find a way through. Oh so ours is a Hip and Valley Roof. Never knew all these terms maybe knew one or two. Combination Roof looks like your typical fast food joint roof like say MC Donalds back in the 80s before all their modernizing was done. I had no clue there were so many roof styles. Our previous home was a hip roof, but we have eight gables with what our guy called California Valleys on our current home. I love gables and the California Valleys are so much nicer looking since they hide the flashing. Great post and article, I didn’t know there was that many different types of roofs out there. I’m looking into building a shed. I want to go with the Gambrel roof for more storage at the top. It looks more complicated to build than just a Gable roof. Does anyone know how much more complicated it is to build and approximately how much more it can cost in materials? Any tips on building roof trusses myself for a shed? If the gambrel roof looks too complicated for your shed, there are kits from 2×4 Basics for building a shed with a gambrel roof. You don’t have to make any angled cuts for the framing. I was wondering why there isnt any information on the french roof, bell roof, octogonal roof, intercecting roof or even the round roof?